Earlier this summer, photos of "Bunny Island" popped up on English language sites. The island, officially named Okunoshima, has been internet fodder in Japan for years. But usually, people only focus on the cute rabbits—and not, you know, the disheartening history bit. Recently on 2ch, Japan's largest web forum, commenters uploaded photos of Bunny Island visits. There are oodles of cute rabbits, along with stark reminders of what actually happened there. During the late 1800s, the Japanese government began to cultivate the island. However, by the mid-1920s, the Japanese military was using the island to manufacture chemical weapons like tear gas and mustard gas. These were later used in China and throughout Asia during World War II. Located in Hiroshima Prefecture, the island was close enough to Tokyo for governmental control, but far away enough to offer the necessary distance and secrecy. Japan acted in total secrecy, even going as far as removing the island's location from maps, because in 1925 the country had signed the Geneva Protocol, which banned chemical and biological weapons. Yet, kiloton after kiloton of poison gas were produced on the island. Even residents were kept in the dark about what was going on, and factory employees suffered all sorts of horrible side effects. Then, there are the countless horrors the gas unleashed on inhabitants throughout Asia. On the island, poison gas production was in operation until World War II's end. Rabbits were also used to test the chemicals. The rabbits that populate the island now are apparently not descendants of the animals used in testing as those were disposed of after the war. 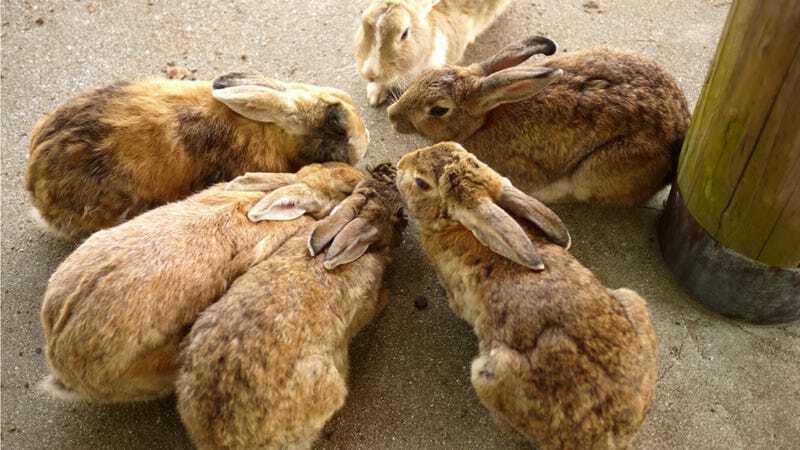 Instead, as the Yoimiuri Shimbun reports, today's rabbits are descendants of eight bunnies that were raised by a nearby elementary school classes and then turned loose on the island in 1971. There are now over 250 bunnies. In 1988, a museum opened to document the island's dark history and warn the world about the dangers of chemical weapons. The island museum reportedly goes into greater (and graphic) detail about how the weapons and the horrible destruction they caused so that, as the museum's plaque reads, "this odious history will never be repeated." Many of the ruins are structurally unsafe and cannot be entered. Below, you can find an extended photo log of the 2ch commenters' visits to those ruins located on the island. The relics are fascinating, and the bunnies are cute, sure, but both are sad reminders of what happened. Catching the Kure Line to Tadanoumi Station. Then taking a ferry to the island. An abandoned power plant. Visitors cannot enter. Here is a poison gas research facility. Empty barracks. It's possible for visitors to enter. The island's northern battery, which housed cannons. The poison gas factory's restrooms once stood here. An ammo and chemical weapons dump. The U.S. Army also used the building during the Korean War, writing "MAG1," short for "MAGAZINE 1," on the wall.